Lelo in Nopo: How did that Pie-Off go anyway? In case you were wondering if that pie thing I was working on was a success or not, check out our Pie Social over at the Portland Pie-Off website for links to all of the wonderful recaps, write ups and media coverage. We knew there was something special about pie, but it's so great to know you think so too. And then check out the cover of today's FOODDay section in The Oregonian. Oh such pretty photos and what a great write-up: there's even use of my most favoritist of terms, Home Arts. You can read it online here. 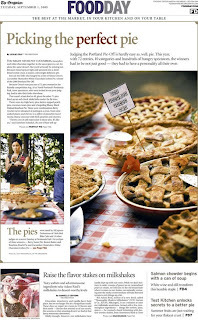 Lucky for you, they've published some of the winning pie recipes! And I love how Leslie captured the fir trees and red checked table cloths in her description: it was truly a lovely summer day in a classic park, with friends, family, and pie. Yes, pie brings people together. Love "home arts!" Will have to use that. It was great to be there....Next year I am entering a pie for sure...good times. I love the term "HOME ARTS" also. I remain a big fan of your blog. I have a jones for some pie!